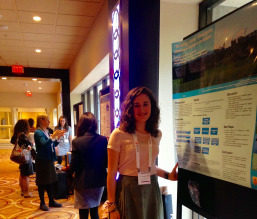 Congratulations to Rebecca Wolff for winning the overall prize and poster competition for the “most innovative research” at the 22nd Canadian Conference on Global Health. The conference took place in Montreal, from November 5th to 7th. Poster Citation: Wolff, R., Harper, S.L., et al. “Its spirit is strong: Shawi healers, spirits and diarrhea in the Amazon” Canadian Conference of Global Health, Montreal. 5-6 November 2015. Waterborne illness remains a public health challenge faced by many Indigenous communities. The Shawi, a dominant Indigenous group in the Peruvian Amazon, have retained the majority of their cultural practices and belief systems. Indigenous illness perceptions may not always reflect known biomedical causes of disease, making some health interventions ineffective. The goal of this research was to explore how Shawi perceptions on the causes of diarrhea, as a symptom of waterborne illness, related to Shawi beliefs and cosmology about water. Semi-structured interviews were conducted in two Shawi communities in August 2014 to document beliefs regarding water spirits and the role of traditional healers in causing diarrhea. Results of this study showed Shawi perceptions on the causes of diarrhea were predominately based in beliefs around water spirits and the ability of traditional healers to cause diarrhea, as opposed to a belief in diarrhea caused by biomedical risk factors for waterborne illness, such as the consumption of contaminated water. This research highlights how understanding Indigenous perceptions of illness is essential to informing the design of more effective health interventions to reduce waterborne illness in Amazonian Indigenous Communities. Click here to subscribe to the quarterly IHACC newsletter!